To follow along with the videos on BuildAModule, you will need a web environment set up, usually with Drupal installed as well. In the next videos we'll demonstrate step-by-step instructions on the quickest way to set up fresh environment, but depending on your situation you find a different approach more useful. For example, using an existing web project to follow along can help you map what you're learning to what you're seeing in the videos. Or, if you have restricted permissions on your machine, you may want to set up a hosted solution. Here we walk through the options so you can pick the best way forward for following along. To follow along with most of the videos on Build a Module you're going to need a Drupal site to test on. With some of our cross-platform video collections, like PHP programming basics, you won't need Drupal but you'll still need a web environment. The simplest way I've found to get a web environment set up for Mac or Windows is to use a program called Dev Desktop. And so in a moment we're going to demonstrate how to use that, as well as how to leverage another program called XAMPP for Linux. However before we get started let me mention a couple of other options for following along. First of all you can use an existing site. Doing this is actually a great way to map what you're learning on Build a Module to what you need to accomplish in the real world. What you see on your screen will often be a bit different than what you see on the videos, so that adds a bit of a challenge, but the challenge is usually worth the added learning opportunities. If you take this approach it's very important that you back up your site first so that you can roll back any changes you make to your files or your database. Also keep in mind that working on a copy of your site that exists on your computer is going to be faster and easier than working on a hosted site, since you'll have direct access to the files. 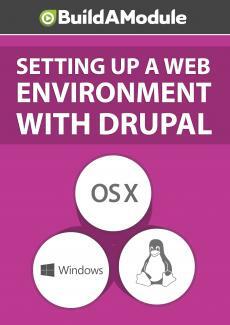 As a second option you can use a hosted Drupal site. If you're borrowing a computer, or you don't have permission to install a web environment on your machine, then this might be your only solution for getting started.